The steaks are high. If we don’t bang, the world could exxxplode. Upping the ante is the best way to take things from zero to banging. Like when the odds are against you in a hand of POKER, a little bluster counts for a lot. My process is to continually top my previous culinary efforts. Not only do my dates appreciate it, my skills improve more by the day. Go all in with your meal. They will swoon and you will collect that POKER BONUS. Meeting the expectation of cooking something nice isn’t enough for me. If it’s not exceptional enough to be remembered when they’re old and gray, I am doing something wrong. 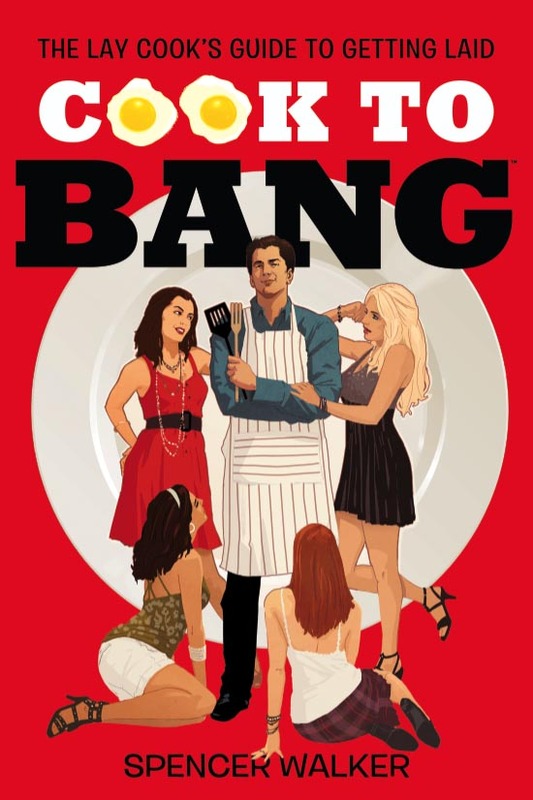 The Cook To Bang legacy must be etched into their sub-conscious and passed down through the generations like alcoholism. All food they taste after, even in Michelin 3 Star restaurants, should taste like sand flavored with sewage. Only then can I relax, a job well done. Sure I could have just made a salad, or drunkenly eat the leftover steak cold out of the fridge. But then I’d have to look at myself in the mirror knowing I was a disappointment to my family, friends, and even my pets. 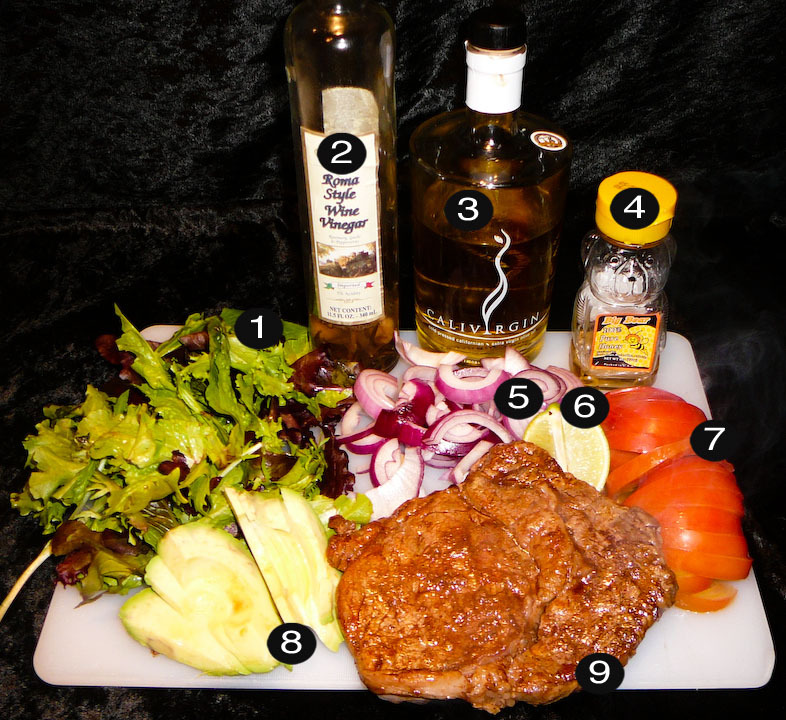 Create the dressing by mixing together the white wine vinegar, olive oil, limejuice, and honey. Combine the lettuce, tomato, red onion, and avocado in a mixing bowl, and toss with the dressing. 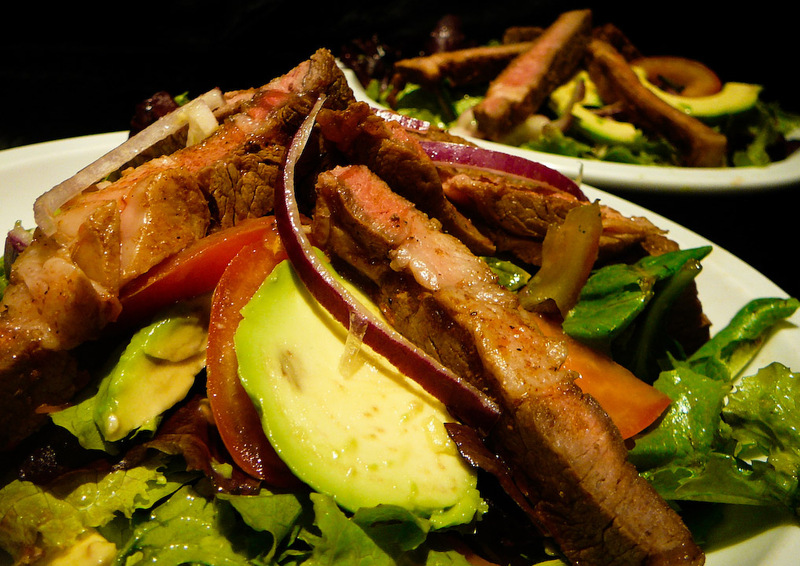 Immediately transfer the salad to plates, slice the streak into thin slices, and artfully arrange over the salad. This entry was posted on Monday, April 8th, 2013 at 9:00 am and is filed under aphrodisiac, APHRODISIACS ANONYMOUS, atkins, beef, healthy, LEAFY & LOVELY, RECIPES. You can follow any responses to this entry through the RSS 2.0 feed. You can leave a response, or trackback from your own site.